Why would your company want a member instead of a customer? Studies show the valuation of companies in the membership economy are anywhere from five to 10 times the size of similar companies which use transactions. 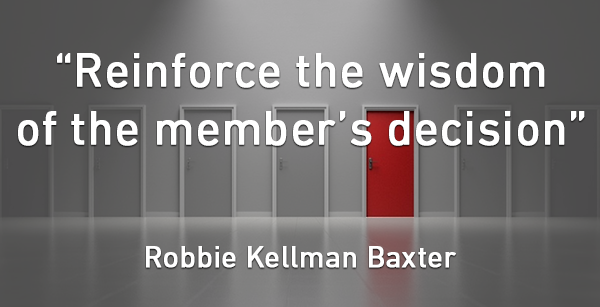 That’s according to Robbie Kellman Baxter, author of The Membership Economy. Baxter is a Silicon Valley marketing consultant whose clients have included Survey Monkey, Netflix, Yahoo, Oracle and eBay. I recently talked with Robbie about what she calls “the forever transaction,” a customer who sticks with you forever. You will learn insights she’s gained from advising nearly 100 organizations on growth strategy. Why Would A Company Want Members Instead Of Transactions? Long-term members give entrepreneurs a more predictable cash flow, says Baxter. Also, companies are able to invest more time and money to acquire a new member than they could for a one-time sale. A membership business lets entrepreneurs get to know one set of customers and continue to serve their evolving needs. Acquisition costs go way down, and profitability goes up. Why Would A Customer Want A Forever Transaction? So why would a customer buy a membership instead of, for example, a course that teaches them a skill one time? It’s because a membership can keep solving their ongoing needs, Baxter says. But, it’s also important to structure a business that does so. For example, if a customer takes an online course teaching him how to draw, once he’s learned all he wants, he doesn’t need the membership anymore. But if the business gets to know its customers, and really understands their challenges, it can continue to expand its offerings. It can teach how to earn a living from drawing, how to use drawing software packages, or how to get into art galleries. How Do You Change A Company’s Culture To Fit The Membership Model? To move from a company based on transactions to one based on memberships demands a different mindset. One that’s focused on the long-term happiness of customers as opposed to short-term revenue, Baxter says. That can mean weening owners away from over-reliance on the metrics found in quarterly reports. “Because the transaction isn’t as important as retention,” Baxter says. The company should also evolve to focus more on member satisfaction and engagement. Members will expect better treatment than one-time customers. They’ll expect to have more of a voice. How Do You Build A Relationship That Keeps Members Long-Term? “Onboarding is one of the most overlooked opportunities to engage and deepen valuable customers relationships,” Baxter states. She lists the following three activities that companies are doing to have effective onboarding. 1. Reinforce the wisdom of the member’s decision. When a customer buys something, he almost immediately wonders whether he did the right thing. “So, if you say right away, ‘Congratulations you’re taking the first step toward having the career of your dreams. We’re going to help you. You’re already better than 99 percent of people who don’t even take one step,’ It reinforces their good decision,” Baxter says. 2. Give some value right away. Pandora does this well. The customer only has to pick one song, and Pandora starts streaming a radio station. 3. Tell members how to get the most value from what they’ve already paid for. American Express offers loads of benefits beyond simply using a credit card—free admission into airport lounges, global entry, free upgrades to first class. And, the company tells members about those benefits immediately, to make sure they get that value. Should Free Trials Be Part Of Your Growth Strategy? 1. To get a buyer hooked on a product they don’t understand. Before Mrs. Fields Cookies became a household name, people thought it was crazy to pay a dollar for just one cookie. Then, they tasted a free sample. “It was literally a delicious bite and they were like, ‘Oh, I understand now. This is not Chips Ahoy,’” Baxter says. 2. To build a network effect. One example is LinkedIn—each new person who joins makes it more valuable for those who are paying. 3. To create new marketing channels. Survey Monkey will let a buyer do a survey for free if it’s only sent to a few people. But, the people who get the survey, may decide they like it enough to buy the larger, paid version. A membership economy business can bring in lifelong customers and build recurring revenue for companies. To master the business model, marketing guru Robbie Kellman Baxter says you should tailor services to match members’ evolving needs, focus on customer retention and happiness, reinforce the sale and help customers learn your service when onboarding. Also, use free trials only when they are likely to create revenue. The customer loyalty and steady cash flow of the membership model will deliver a peace of mind that allows you to truly enjoy your business.